I absolutely love using canned beans. They're inexpensive, non-perishable and a quick and healthy way to add protein to a meal. While I occasionally use dried beans, 9 times out of 10, I rely on the convenience of canned beans. Only problem? Canned beans can often be high in sodium and the starchy liquid in the bottom of the can add a slightly funky, muddy taste to your finished dish. To avoid this, I always drain AND rinse my canned beans under cold running water before adding to my recipe. 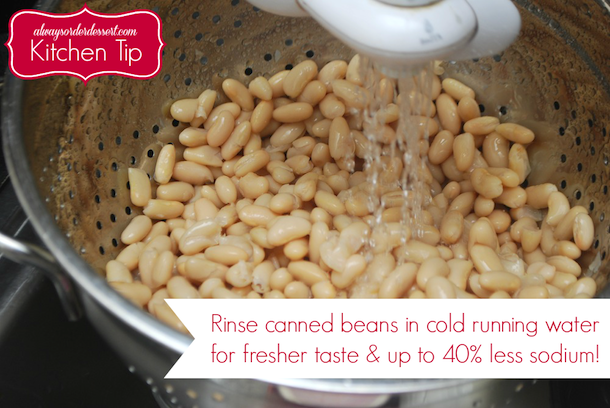 Rinsing canned beans before using reduces sodium by up to 40% and leaves you with beans that taste fresher. Add this quick step to your routine and you'll end up with a much healthier and better-tasting final dish. Click here for more quick and easy kitchen tips.